None of these sources is a guarantee that I’m going to like the books (clearly), but, as I mentioned here, they’re a good way to help ensure I’m reading more 3.5 books than 1.5 books. When choosing this book, however, I decided to try something new. Here’s how it came about: I recently Googled “I Know What You Should Read” to see how the blog was faring. Good news: IKWYSR and the IKWYSR Facebook page popped up first in my search (thank you all for that, by the way; that didn’t used to be the case). I decided to enter John Green’s The Fault in Our Stars for a couple reasons: 1) it’s the only book on the blog thus far to which I have given a rating of 5, and 2) it’s YA, and I was in the mood for some fun YA fluff. None of them are unreadably terrible, and a few of them (The Spectacular Now, Why We Broke Up, and The Lover’s Dictionary) are pretty good, so I decided to give the list a shot and read one of the recommendations. From the list, I chose The Diviners . To be fair, this wasn’t an entirely random choice. 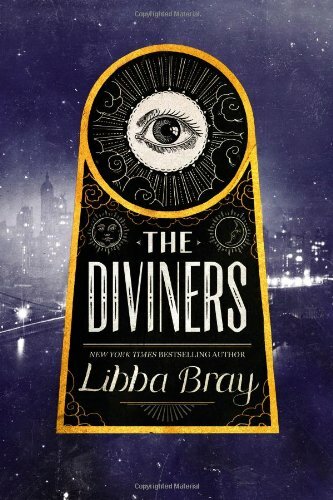 The Diviners is on the ALA’s Best Fiction for Young Adults and Publishers Weekly’s Best Children’s Fiction of 2012 lists, so I thought it had a good chance of being at least halfway decent. It’s the Roaring Twenties, and Evie O’Neill is a small-town girl from Zenith, Ohio, with a special, secret skill: she can “read” objects. When Evie touches something personal like a watch or a handkerchief, she can glean its owner’s secrets. One evening at a party, she gets a little tipsy and decides to show off . . . but she ends up learning a friend’s embarrassing and horrible secret. After she announces it to the rest of the party, he and his parents threaten to sue her for defamation. When Evie’s parents find out, they decide to send her to live with her uncle (who runs the Museum of American Folklore, Superstition, and the Occult–known fondly as “The Museum of the Creepy Crawlies”) in New York City. Evie doesn’t see this as a punishment at all; she is thrilled at the prospect of being a part of the flapper scene in the big city. Once Evie gets to New York, she is surrounded by other Diviners. “Diviners” aren’t necessarily people who can read objects like Evie; “[i]t’s a name for people with rare gifts.” Among them are people who can walk in others’ dreams, a boy who is clairvoyant, a young man who has the power of redirection (he can make himself virtually invisible by willing people not to see him), and a young man with healing hands. In this, the first of what is supposed to be a four-book series, the villain is a super creepy dude named Naughty John. He is responsible for a series of ritual murders. With each murder, he takes from his victim a different body part and becomes a little stronger. Evie and crew are racing to stop him before he becomes too powerful. The book is 600 pages (you should know by now how I feel about super-long books). But, as my brother so eloquently put it the other day, “YA pages be different.” It reads as quickly as a 300-page “normal” book. As I’ve mentioned before, super scary and I don’t get along well. But I can handle (and enjoy) the moderately creepy. This definitely fits that bill. The setting is delightful (who wouldn’t love NYC in the Roaring Twenties with all of its flappers and speakeasies and old-school slang and such?). The characters are fun and interesting (weird super-powers? Yes, please!). But the book as a whole is not a ridiculously good page-turner like The Hunger Games. That said, it’s certainly fun and exciting in parts. Who should read it: Shana (i.e., people who enjoy a good YA series and don’t mind a little bit of violence). Still not sure if you want to read it? You can read the creepy first chapter here on the book’s website to decide if you’re into it. What comes next? The next book in the series, Lair of Dreams: A Diviners Novel , is scheduled for release in August 2014. This entry was posted in Rating: 3.5/5 and tagged Book review, Books, Libba Bray, The Diviners, What Should I Read Next?. Bookmark the permalink. I’m too old to really understand tumlblrs, but it seemed intriguing for the 2 seconds i looked at it. Ah, yes! I have seen the ol’ http://gobookyourself.co/. It’s a fun concept, but a bit difficult to navigate. That may, of course, be a symptom of my age. Oh, tumblr! How you vex me! !